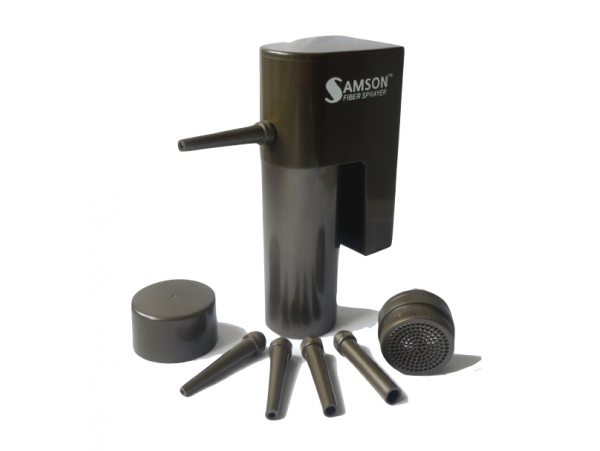 The Samson Fiber Sprayer is a battery operated device that is designed to spray lose fiber. This enables you to maximize use and spray fiber constantly, with the control over the speed, flow and direction of the fiber applied effortlessly, rather than apply it manually by shaking the container like a salt shaker over the area needing the application. The Samson Fiber Sprayer is a battery operated device that is designed to spray lose fiber such as but not limited to hair building fibers made of natural and synthetic fibers. The Fiber Sprayer accommodates a micro motor-pump, battery housing 4 removable nozzles and has two speeds represented by two separate switches, all compacted to a light weight hand held device. The Fiber Sprayer is designed to fit over fiber container that is available for sale in the open market by several brands. This amazing invention enables you to maximize use and spray fiber constantly, with the control over the speed, flow and direction of the fiber applied effortlessly, rather than apply it manually by shaking the container like a salt shaker over the area needing the application. The user places the container by screwing it into the main body and presses any speed to start. While the motor pump is activated by blowing concentrated air on the powder and pressurizes the container, causing the fiber to circulate and flow out through the nozzle. The two speeds and 4 nozzles enable the user to control the amount and flow speed of the fiber.